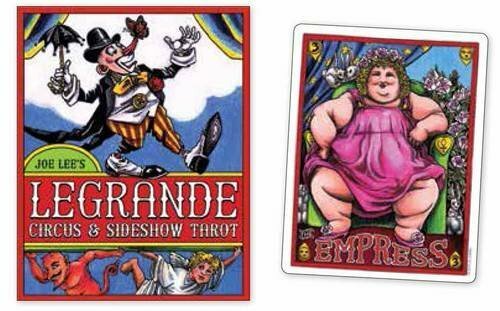 LeGrande Circus and Sideshow Tarot, from illustrator Joe Lee, is a delightful addition to the U.S. Games family of decks. It’s not the first circus tarot in the world, but it is unique in plenty of ways, while remaining comfortably and immediately readable for tarot students at any level of experience. In recent years, US Games has started producing some interesting boxes for some of their decks. LeGrande Circus and Sideshow Tarot comes in a colorful box with a lift-off lid. The tradition of keeping your active tarot deck in a pouch or cloth rather than the original box seems less appealing when the card boxes are nicely designed. LeGrande Circus and Sideshow Tarot is a standard 78 card deck that honors Waite tradition. It is larger and more square than a typical deck. The card finish is matte and the card backs are reversible. The cards are numbered with Arabic numerals rather than Roman. Joe Lee, the artist and author of this interesting deck, has a great backstory. He studied art and mediaeval history in college, and then went to Ringling Brothers, Barnum and Bailey Clown College and became a circus performer. Clearly, the tarot deck he designed and illustrated is a merging of his personal interests, knowledge and experience. For me, that kind of personal connection gives this deck a lot of depth, even if the theme or illustration style might seem frivolous. When I was in middle school I wanted desperately to grow up and attend Clown College. Reading with this deck feels a little bit like a chance to relive that dream within my actual chosen profession of tarot. LeGrande Circus and Sideshow Tarot is illustrated in bright primary colors in a cartoon style reminiscent of mid-century circus posters. The Major Arcana keep their traditional names. The High Priestess is called the Popess, and is a sideshow fortune teller. The Hierophant is the Pope, and is the circus owner. The Minor Arcana suits are Wands, Coins, Swords and Cups. I appreciate that Joe Lee resisted the trend to rename the Majors and the suits to fit more closely with his theme. Each suit, however, does correspond with an aspect of the circus. The Wands are the tent poles, and the people who do physical work to make the circus happen. The Coins are the vendors and salespeople. The Cups are the circus performers, and the Swords represent the darkly bizarre sideshow. The enclosed little white book, written by Joe Lee, is informative and comprehensive. Lee includes revered interpretations. The card backs are revisable, and are probably my least favorite part of the deck. The smiling clown heads seem downright creepy. Joe Lee’s LeGrande Circus and Sideshow Tarot is a fun theme deck that is smart enough to be a working tarot deck. The colorful images will delight even the most squeamish clients. I think many working readers will enjoy working with this deck at carnival gigs. This deck will also make a thoughtful gift for any of your friends who collect clowns, or circus memorabilia. I like the circus theme for tarot. It reminds me of the Fool, and reminds me that even the worst circumstances look better behind some glitter and glamour.